Since graduating in 2015, Marco Fluri has gone on to work as a Manufacturing Associate for Biogen in Bern, Switzerland. Tell us what you have been doing since completing your studies. After finishing my undergraduate degree, I went directly onto a masters in biotechnology, bioprocessing, and business management at the University of Warwick that ended in 2016. I have recently accepted a position in pharmaceutical manufacturing that will be starting in April. What is the best, most exciting or fun thing that you have done in your career? Even before I started my undergraduate degree, I was doing vocational training at an upstream biotech lab working with plant material. It was a GMP facility and even then I was able to handle a lot of the tasks and maintain specific product lines myself. The team was fantastic and it was very interesting and rewarding to know that my work was helping medical research projects. What would you do differently since graduating? Everyone says this, but don’t wait until the last minute. Everyone is guilty of not being proactive enough at one point or another, but the lecturers told us to do what they say and start early. I can assure you that you will hear it again, but you can never really hear it enough. Imagine you were about to start university again - with the benefit of hindsight - what would you now tell yourself to have done differently? If I had known how important it is to make connections and how they help to expand career opportunities, I would have gotten the most out of my time on campus and talked to as many lecturers and researchers as possible. What many take for granted is that the time spent at university is not only for lectures and revision, but also to communicate, meet people, and discover opportunities through the people your professors know as well. There are a lot of useful resources outside of the library and lecture theatres. What was your main reason for choosing to study your course at Plymouth? With hindsight how significant was this for you? Having moved around a lot, I had the language barrier starting secondary school but the school I attended had connections with Plymouth. I would have had to attend for half a year anyway to be rewarded the necessary qualifications to pursue an undergraduate degree in my home country, yet I wanted to see something new and I knew that this was going to be my best chance. I started a full-time course that I knew would make a lot of options available afterwards. Looking back, I enjoyed my time a lot. The course I chose was very informative and fun. I met a lot of interesting people and that allowed me to pursue an extremely engaging postgraduate degree. 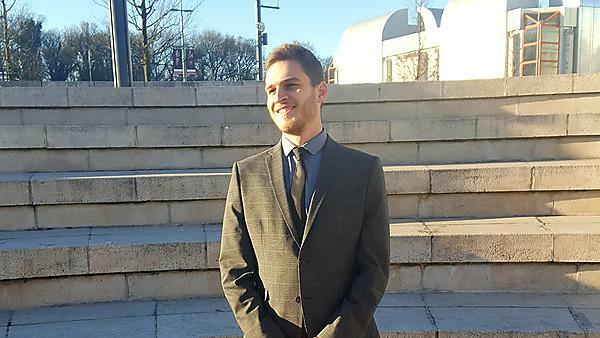 How did studying at Plymouth change your career aspirations and plans? Originally, I did not quite know which aspect of biology I wanted to pursue. My course was very broad, so I was able to see many facets and thereby determine what was of most interest. I ended up moving towards biotechnology and the people I talked to were very helpful when choosing my next step. What is your favourite memory of studying for your degree at Plymouth? I was not one to revise in the library. I worked better at home, but during a group project we spent an all-nighter in the library – which is a very fun time to be in the library. You get to see a lot of people you normally wouldn’t. It’s especially interesting if you’re a behavioural biologist. How well did Plymouth prepare you for the challenges that you have faced, or will face, in your career? My course was a very useful transition into a more professional and active environment. A lot of people have the impression that you are thrown into open waters when you start university, but I felt that the approach of the course was very accommodating and better prepared me for future surprises. Why would you recommend undertaking a course with Plymouth University? I can’t speak for the locals, but for anyone thinking about studying abroad that wants a complete change of environment, then Plymouth University is at the centre of a sea-side city, so you will never get bored. If you are an international student, how did we help you to get used to living and studying in the UK? I was quite lucky that my native language is English. The Unite dormitories were great and there was always someone ready to help. There was always someone to assist you there or on campus with any issues. For more information please visit our BSc (Hons) Biological Sciences course page. For more information about our range of courses within the School of Biological and Marine Sciences, please visit the school page. Want to find similar alumni? If you would like to find out what other alumni from the School of Biomedical and Healthcare Sciences are currently doing, please visit the biological, health, chemical and agricultural sciences interest area.